All chimes are tuned in the key of C, with the corresponding notes and chords printed on one side of the windplate (a.k.a. wind sail). With an invigorating quality, Himalayan Echo inspires a vision of misty mountains in faraway places, morning sunrise, and the smell of sandalwood. This chime is hand-tuned to the key of C.
If you want the most beautiful-sounding and well-built wind chimes on the market, you've come to the right place. Designed for ultimate clarity of tone and resonance, Grace Note's classic tuned wind chimes feature a unique pinned suspension device combined with superior materials and craftsmanship. Our chimes are available in a multitude of sizes, from petite all the way up to our deluxe chimes, which are a full 7 feet tall. Our precision-tuned wind chimes have earned the reputation of being the most musical wind chimes on the market. Grace Note's wind chimes are available in 9 sizes and 7 different tuning. Our classic wind chimes offer a broad spectrum of tones, and our pricing fits most everyone's needs. All chimes are tuned in the key of C, with the corresponding notes and chords engraved on one side of each windplate. Classic wind chimes are handcrafted from thick-tempered aluminum tubing, with a soft brushed finish. 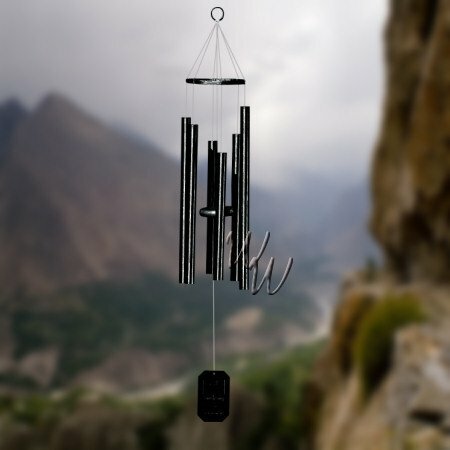 Grace Note Chimes has created a new earth-friendly chime, featuring slate tops, strikers and windplates. The slate is a product of Mother Nature and will require a little more care - the slate cannot freeze. We highly recommend that the chimes be brought in if the temperature is near or below freezing. We also recommend that you bring the chime in under high winds or other extreme weather. The slate chime carries a one year warranty. Our chimes make great gifts, and can be delivered gift wrapped.